Are Rowing Machines Worth It? Posted on February 11, 2019 , in Rowing Machines. Although most people are familiar with rowing machines, many may not understand how they work or the type of workout they’ll give your body. That fact is that rowing machines can provide a well-rounded workout completely on their own. You’ll get a good workout of your leg muscles including your quads, hamstrings, and glutes. Plus, it’ll work your arms, shoulders back and core muscle group as well. 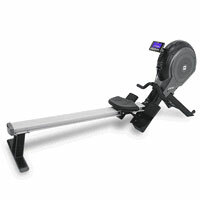 A rowing machine workout will also increase your heart and breathing rates. So, when it comes to the question of, “Are rowing machines worth it?” it really comes down to your preferred method of workout, your budget, the space you have to work with and the motivation you have to use it. This article will go over some of the factors you might want to consider before buying a rowing machine. The prices of rowing machines can vary considerably. You could spend less than $100 on a used machine or more than $1000 on a brand new, top-of-the-line model. But just because your machine costs more won’t necessarily mean it’s better. It is true that you’ll have to pay somewhat of a premium to get a rower composed of quality materials, but the most expensive models may come with a lot of bells and whistles that you’ll never use. You might also want to keep an eye out for warranties on parts and labour. Although it’ll be unlikely you’ll have immediate trouble with a brand-new machine, parts may wear out after years of use. The type of home you live in might play a role in the type of machine that will work best for you. If you have limited space, you might benefit from a machine that’s easily folded up and put away. Some rowing machines are quite noisy. Although this might not matter if you own your own home, if you live in an apartment, you may end up with issues with your neighbours after awhile. For some people, motivation isn’t a problem and they’ll just get down and get to work on a regular basis without much prodding necessary. If you find motivation a problem but have a competitive personality, you might consider investing in a machine that has a readout to allow you to monitor your speed and progress. There are machines that come with electronic displays that allow you to compete against a virtual competitor or your own personal best. Turning a workout into a game can work wonders for those who work better when there’s some competition involved. If the simple fact of getting an exhausting workout on a single machine is motivation enough, rowing machines provide much more of a challenge than most CrossFit trainers or treadmills. Now that you know if a rowing machine is right for your home gym, download our latest promotions to save.